Sweet and spicy. That might describe my own personality a bit, but it definitely fits this salad. An easy, healthy meal for a hot summer day, or if you’re like me, year round! Another salad? Isn’t this kind of cheating? Perhaps. The cook-from-scratch purist in me is embarrassed to pass off my go-to salad as a recipe. Ok, so I’m a purist except for peeling and chopping vegetables and fruits – I have no shame in shortcuts that buy me a virtual sous chef. But I do (expletive) love salads. As in I eat one every day in which I am in a country with potable water. Even then, the first thing I’m willing to risk my strong stomach for is a salad. Ask anyone who was in Tunisia with me when I got food poisoning from a grilled chicken salad this past year. Even then, I’m pretty sure it was the chicken and not the raw vegetables that made me ill. It stopped me from eating salad from that establishment, but the self-imposed salad ban lasted all of a week. If you knew me as a very, very picky child and even teenage athlete, it has to be pretty funny to see me now. You could only get me to eat salad once before the age of 17 – and that was only because it was in front of my idols. I am not exaggerating. The joke is on me! Anyhow, you can see why I chose to share such a simple meal suggestion. This particular salad is a version of one I’ve been eating almost every single day (when I’m not traveling) for at least two years. I say that to vouch for its nutrition, deliciousness, and versatility. The dressing makes this salad amazing. 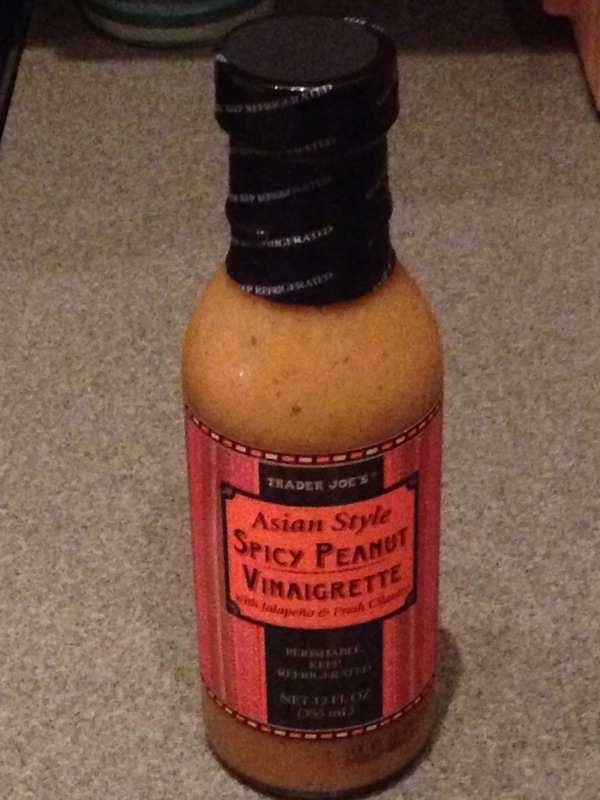 Trader Joe’s Asian Style Spicy Peanut vinaigrette does not resemble truly authentic Thai flavors – they are too clean and Americanized, missing elements like oil, tamarind, basil, and fishiness, but I still find it pleasant. I’ve introduced many people to this dressing and seen way more “Wow!” reactions than “meh.” It has enough sweetness to overpower the bitterness of arugula and broccoli slaw, peanut butter for richness, and jalapeno to kick things up at the finish. I believe it works well with almost anything you could put in a salad except for dairy. It is a bit thick, so I add rice wine vinegar or lime juice to cut it. Arugula forms the base of the salad. Arugula is my favorite green. It is the right size, requiring no cutting or chopping like Romaine or Bibb lettuces. It has just a hint of bitterness and a forgettable (in a good way) texture as compared to a mesclun mix with frisee and radicchio. Julienned carrots or broccoli slaw are its companion. 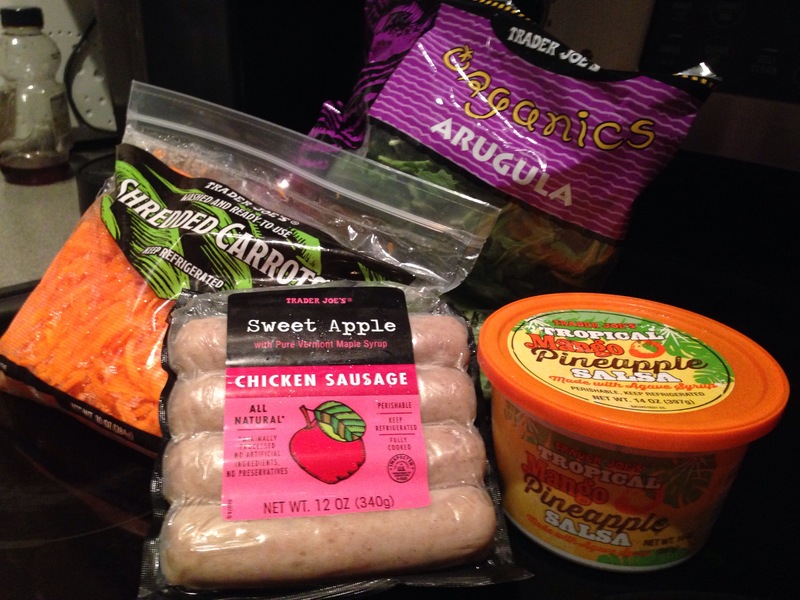 Sweet apple chicken sausage, which needs no further description, is the perfect compliment to the vegetables. I often add chilled, cooked lentils (available, pre-packaged in many supermarkets) for fiber and more protein (not pictured). They also soak up the dressing nicely. Shelled edamame, black beans, or garbanzo beans (chickpeas) also make good fiber sources. I have an addiction to Trader Joe’s pineapple-mango salsa (try it with plaintain chips! ), and in the early stage of that addiction, I added it to this salad. It has become the secret weapon of this salad, adding intense flavor and more heat without a lot of calories (it does have agave nectar in it, so don’t go overboard). Using it on the salad also prevents me from killing it with plaintain chips in two sittings. Sundried tomatoes, sprouts, and diced bell peppers are great additions to this salad, as are chopped peanuts or cashews, if you are vegetarian or just want more variety and texture. Once again, I leave you to make your own decisions. If you don’t have access to a Trader Joe’s, many of these ingredients are still accessible from other brands, or you can make a similar dressing or salsa yourself. Combine all ingredients and toss thoroughly to mix. Serve immediately.